An All-Natural product that increases the plants ability to absorb water and nutrients from the soil. This creates a stronger and healthier plant, making it more resistant to disease and a more productive plant. To be used when planting or transplanting any plant, not just trees and shrubs. 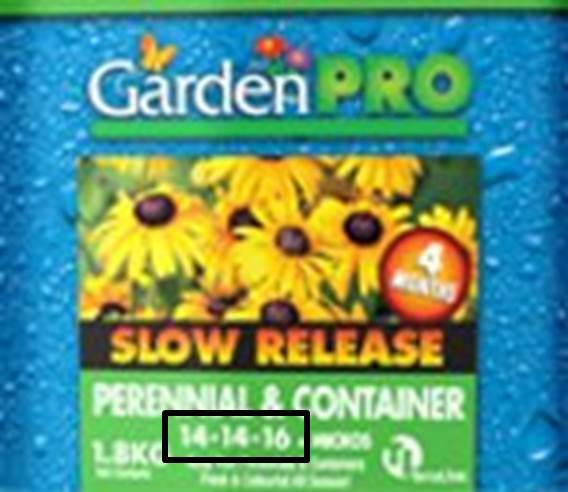 On the label of a fertilizer product, there are three numbers that will be prominently displayed. These numbers represent what percentage of Nitrogen (N), Phosphorus (P) and Potassium (K) that are found within that particular package. The numbers are always listed in the order of Nitrogen, Phosphorus and Potassium. A good way of remembering what each element does is to remember the phrase, "Up, Down and All Around". Nitrogen (first number) stimulates above ground growth, promoting foliage growth. Lawn fertilizers will have a high Nitrogen content. Phosphorus (second number) is effective in stimulating root development as well as promoting flower and fruit production. Fertilizers designed for flower production will have a high Phosphorus content. Potassium (third number) helps to maintain the overall health of the plant. It helps the plant withstand any stresses, including pests, cold temperatures and diseases. Fertilizer Options Available: All fertilizer products contain a label with feeding and mixing instructions. Helps to build and establish a strong root system while minimizing transplant shock. Excellent for planting trees, shrubs, roses, perennials, bedding plants and vegetables. A long term source of phosphorus that promotes root development, flower and fruit formation. Use when planting trees, shrubs, perennials, roses and bedding plants. Feeds hanging baskets or containers for up to 4 months. Can be used with a liquid or water soluble fertilizer. Feeds perennials and containers for up to 4 months. Mix into the top layer of soil in perennial and flower beds as well as any containers containing perennials. Promotes flower and root growth as well as enhancing resistance against stresses and dieases in roses. Helps to promote root development and disease resistance. Can be used in flower, shrub and vegetable beds. Provides the required nutrients for tomato plants and helps to enhance fruit firmness and prevent against blossom-end rot. This granular fertilizer provides perennials and vines with a boost of essential nutrients needed to keep the plants healthy and strong. Helps to maintain the deep green foliage of evergreens by providing them with essential nitrogen, iron, magnesium and sulphur. A soil acidifier that lowers the pH of the soil for acid loving plants.